NASA FAKED A SHUTTLE IMAGE!!!!! BABloggee parkylondon alerted me to this NASA image of the Space Shuttle Atlantis’s cockpit, taken in March 2000 during mission STS-101. He sent me a note via Twitter telling me how much he liked it, but as soon as I saw it I smelled a rat. A SPACE SHUTTLE-sized rat. I didn’t have to think twice. I knew right then and there, NASA was hosting a faked image on their own servers. There was no way this was a simple snapshot of the Shuttle’s interior! All my years as an image analyst, coupled with my long battle-hardened abilities with conspiracies and fakery, told me I was on to something big here. Very big. Why are there stars in the picture? First, the cabin lights were on. That means the photo would use a SHORT exposure time and a SMALL aperture, otherwise the bright interior would be overexposed. But there’s no way you could see stars in a photo under those circumstances! Second, those interior lights would reflect inside those windows, again drowning out any outside sources. Whenever you see astronauts taking pictures out the windows, they are always RIGHT UP next to the windows, not a few feet away. Why? Because otherwise the reflections block the view. Third, and worst, the Earth hangs fat and bright right smack dab in the center of the viewports! The bright Earth could not possibly be exposed correctly and have the photo still show stars in the windows. The Earth is THOUSANDS of times brighter than the stars. Even the Moon would look dull and dim if the Earth were exposed correctly. There’s only one explanation: Someone at NASA faked the photo!!! They added in stars later, for what nefarious purposes only the Top Brass at NASA must know. Was this mission faked in some way? Was the whole Shuttle project faked? Does NASA even exist? Have you ever even seen NASA? At this point, I wondered if maybe I was making too much of this. If I was really breaking new ground here like Galileo or Einstein did, then I had to be careful. A paradigm shift this big could rate a NOBEL! Maybe this was just a mistake, and the caption of the picture would say something about it. It would give some innocent reason why NASA would add stars to a photograph… but here is the complete caption on the NASA page for this image. Read it and see the deception. 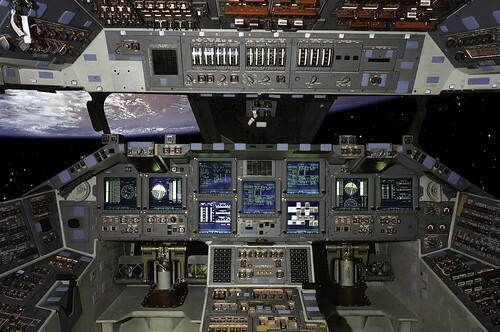 JSC2000-E-10522 (March 2000) — Eleven new full-color, flat-panel display screens in the Shuttle cockpit replace 32 gauges and electromechanical displays and four cathode-ray tube displays. The new “glass cockpit” is 75 pounds lighter and uses less power than before, and its color displays provide easier pilot recognition of key functions. The new cockpit is expected to be installed on all shuttles in the NASA fleet by 2002, and it sets the stage for the next cockpit improvement planned to fly by 2005: a “smart cockpit” that reduces the pilot’s workload during critical periods. During STS-101 Atlantis will fly as the most updated shuttle ever, with more than 100 new modifications incorporated during a ten-month period in 1998 at Boeing’s Palmdale, Ca., Shuttle factory. Nothing. Not a word as to WHY NASA WOULD HAVE FAKED THIS IMAGE! Our tax dollars paid for this picture! Hundreds of billions of dollars of American citizens’ money has been sent to NASA, and really what do we have to show for it? NASA’s promises, and a bunch of pictures. And this one is CLEARLY faked! My course of action is clear. I am demanding NASA shut down the Shuttle program. We cannot let this type of trickery stand. Now, realistically, they cannot simply turn off the whole program. I can be magnanimous. So I will give them some time… let’s say a year. No, a year and a half. I’ll give them, say, eight more flights, but then I want the Shuttle Transport System shut down for once and for all. NASA, I await your call.